Kofukan Ryokan near Myokokogen Station was opened in 2004 featuring large rooms with both Japanese and Western style accommodation available. It is only three minutes by free shuttle from Myokokogen station with wonderful relaxing hotsprings and a great view of Mt. Myoko. Discount ski lift tickets are also available for purchase. Friendly service (in English), great food and reasonable tariff. 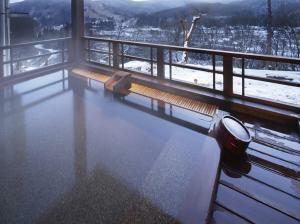 Kofukan offers a hot spring bath, multi-course Japanese dinners, and Japanese-style rooms. One child under 2 years stays free of charge when using existing beds. A free shuttle is available on weekdays only to/from Akakura Ski Resort and Ikenotaira Ski Resort. Myoko Sunshine Land is a 15-minute drive, and JR Myoko Kogen Station is 1 km away. On-site parking is free. There is a free shuttle to/from JR Myoko Kogen Train Station. 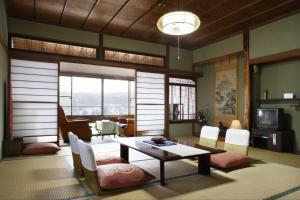 The spacious rooms at Kofukan Ryokan feature tatami (woven-straw) flooring and shoji paper screens. All are air-conditioned, with a fridge and electric kettle provided. The en suite bathroom has a bathtub and Western toilet. WiFi is available in public areas and is free of charge. The hotel sells ski passes and has ski storage.